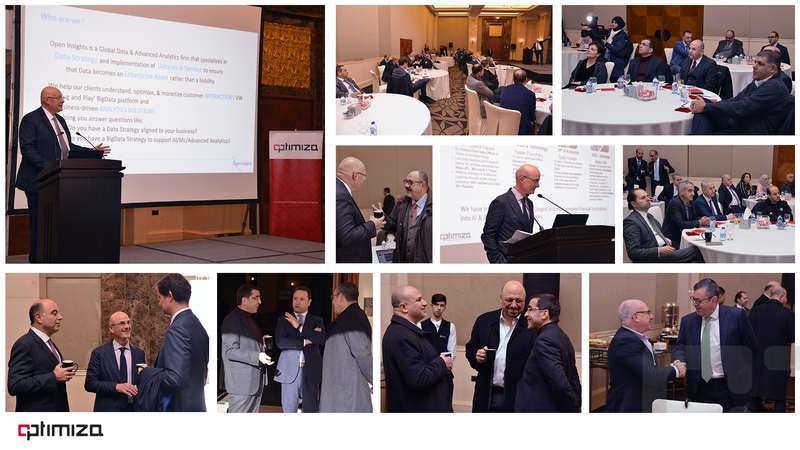 Amman, January 07, 2019 – Optimiza hosted today in the morning a C-level presentation on Big Data & AI, presented by data scientist Dr. Usama Fayyad the international speaker on Business Analytics, Data Mining, Data Science, and Big Data. The tech talk was held at the Four Seasons Hotel – Amman, and last for two hours, with the attendance of the minister of MoICT HE Eng. Mothanna Gharaibeh, Eng. Nader Thneibat, MoICT Secretary General, and Jordan’s Banking Executives. On the talk Dr. Usama Fayyad the Chairman & Founder at Open Insights – a technology and strategic consulting firm he founded to help enterprises deploy data-driven solutions to grow revenue from Data assets through Big Data strategy, and deploying, AI/ML in large enterprises- shares leading practices and real-world examples of the importance of having the right data strategy and practices to make Artificial Intelligence work pragmatically for enterprises. The talk aimed to highlight on enterprises competitive edge in the rapidly changing data landscape through the use of artificial intelligence and large data. Al-Faris National Investment Group, brand named Optimiza, is a leading publicly-listed regional ICT Systems Integration and digital transformation solutions provider (ASE:CEBC). With over 35 years of region wide technology systems integration experience and hundreds of projects delivered, Optimiza’s intellectual capital spans diverse industries, enabling over 400 professionals across the MENA region to integrate and deliver successful, innovative, and reliable consulting and technology solutions. With a commitment to excellence and customer satisfaction. Optimiza is specialized in offering business solutions and services in areas of management consulting, information technology, outsourcing, and training.